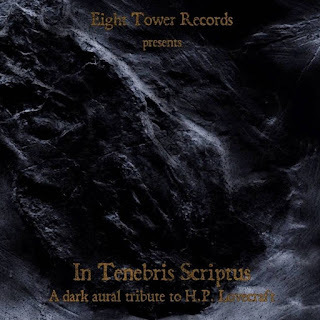 This is a review of a compilation that consists mostly of bands or musical projects in the occult, ritual, dark ambient, drone and experimental genres paying homage to the writings of H.P Lovecraft which was released in 2018 by Eight Tower Records and called "In Tenebris Scriptus - A Dark Aural Tribute To H.P Lovecraft" and we will review the songs one by one. Monocube brings us "Dwelling In Mayhem" which starts out with acoustic guitars and ambient style synths while the music is all instrumental and also mixes in elements of dark ambient and drone. Next up is Corona Barathri with "Litania Antiquis" which starts out with some spoken word parts and ritualistic soundscapes while the track is also long and epic in length along with some grim black metal vocals and stringed instruments also being used at times as well as some melodic chants. Nile Impvlse brings us "Astrophobos" which starts out with some ritualistic soundscapes and drones along with some programmed yet militant drum beats, noises and ambient style synths as well as some evil sounding whispered vocals and the track is long and epic in length. The Serpent brings us "Corona Nyarlathotepis" which starts out with some field recordings and nature sounds while the track is very long and epic in length along with some ambient style soundscapes which also gives the music more of a ritualistic feeling and towards the end demonic spoken word parts can be heard briefly. Sonologyst brings us "Cryptic Realms" which starts out with harsh noises and ambient style drones while the music also gets very experimental and avant garde at times as well as adding in some ambient style synths and the music is instrumental. Noctilucant brings us "The Haunter of The Dark" which starts out with some rain and thunder sounds along with some elements of ambient and drone along with the songs making the music sounding more atmospheric and towards the end ritualistic spoken word parts can also be heard briefly. Martyria brings us "A Light on The Hilltops" which starts out with some ritualistic drum beats and ambient style drones while the synths makes the music sound more atmospheric along with a small amount of spoken word parts. Xerxes The Dark brings us "Dagon (MMXX)" which starts out with ambient style soundscapes and filed recordings while the spoken whispers makes the music sound more ritualistic while also mixing in some avant garde elements. Moloch Conspiracy brings us "The Shadow Over Innsmouth" which starts out with a very atmospheric and dark ambient orientated sound while the track is very long and epic in length while stringed instruments and noises are used at times as well as the music being all instrumental. New Risen Throne brings us "Out Of The Aeons" which starts out with some field recordings and atmospheric drones while the track is very long and epic in length while along with the music getting very ritualistic at times as well as a small amount of spoken word parts. Adonai Atrophia brings us "The Black Seas Of Infinity" which starts out with some atmospheric sounding drones and dark ambient elements while the track is long and epic in length along with the synths making the music sound more atmospheric and the music is all instrumental. Hezaliel closes the compilation with "Chtulhu" which starts out with some atmospheric sounding drones while the track is long and epic in length along with a great amount of ambient and ritualistic elements as well as being all instrumental. In conclusion I feel this is a very great sounding split and I would recommend it to all fans of H.P Lovecraft, dark ambient, drone, ritual, and experimental. 8 out of 10.